Warm, fluffy pretzels accompanied sweet, hand-stuffed sausage atop brussels sprout sauerkraut, with a flavorful mustard seed fondue for dipping-WOW! A Business Traveller article published on-line by CNN Travel (and updated this spring) has spotlighted resorts and hotels that grow their own food. Reporter Allison Tibaldi’s Farm-to-hotel: 10 resorts [and hotels] that grow their own food includes four destination resorts in the United States: The Lodge at Woodloch in Hawley, Pennsylvania; Blackberry Farm in Walland, Tennessee; Omni Amelia Island Plantation Resort in Amelia Island, Florida; and Woodstock Inn & Resort in Woodstock, Vermont. Two destination resorts included in the list are in tropical areas, Chablé Resort and Spa in Chochola, Yucatan, Mexico; and Petit St. Vincent in St. Vincent and the Grenadines; and one in Canada, Nita Lake Lodge in Whistler, British Columbia. Also included in the Business Traveller list are three hotels: Crosby Street Hotel in NYC, which has a rooftop home for a lovingly nourished urban fruit and vegetable patch; The Fairmont San Francisco which maintains a 1,000-square-foot garden including a wild bee hotel producing the hotel’s prized honey; and Congress Hall in Cape May, New Jersey which operates nearby the 62-acre Beach Plum Farm, nestled in protected wetlands. Recently, our contributor, Lucas Knapp, enjoyed dinner at Larks Restaurant in Medford, Oregon, a dining destination which is located at the Inn At The Common in southern Oregon, a rural part of the state that is home to rolling orchards, vineyards, and a steadily growing community of farmers and food purveyors dedicated to sustainable agricultural practices. Less exclusive and more affordable than the resorts and hotels included in the Business Traveller article (and easily patronized by a local resident), the Home Kitchen Cuisine offered by Larks Restaurant, located in a renovated 1960s motor inn, also confirms that creative hotel dining, is taking root in the downtown of a small city, in this case inspired by the bountiful agricultural riches of southern Oregon. Our night at Larks began with a cheerful redheaded waiter who brought us rosemary ciabatta from Rise Up! Artisan Bread, the very local bakery of Full Bloom, an intentional community in Oregon’s Little Applegate River region. The Full Bloom community is dedicated to slow food, fair wages, and community activism. This sentiment is shared by many of Southern Oregon’s local food purveyors, like Wildcraft Cider Works, a local cidery in Eugene, OR. We had their excellent peach cider at dinner, tart, crisp and refreshing. Their mission as stewards of the outdoors informs their commitment to ensure their ingredients are always regional. Our delicious meal that followed substantiated they’re not alone. For a first course, we sampled a handful of other purveyors committed to the same ideal. 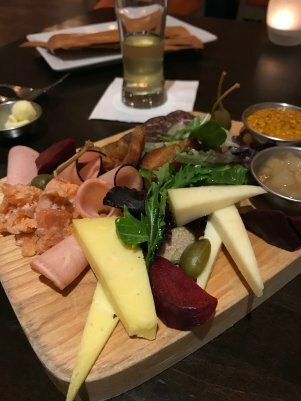 The farm plate, a curation of various pickles and charcuterie prepared in-house, and local cheeses, featured slices of bresaola, accompanied by smoked salmon from the Oregon coast and pork belly from Carlton Farms in Carlton, OR. As we noshed on Walla Walla Cheese Company (Milton-Freewater, OR) Drunken Dragon Cheese and By George Farm (Little Applegate, OR) cheese, chef Maggie Trujillo, who was born in Idaho and trained in culinary school in Portland, OR, stopped by to elaborate on the various techniques utilized in the kitchen. Take the bresaola, for example. Trujillo cures a New York steak from Cedar River Farms in Colorado, marinates it in wine, then dries and hangs it for six weeks. The Carlton Farms pork belly is similarly prepared, cured in-house, smoked, then sous vide for 24 hours. Trujillo’s enthusiasm for real food, mindfully grown and raised, was palpable, and she proudly noted how Lark’s is a 100% scratch kitchen. 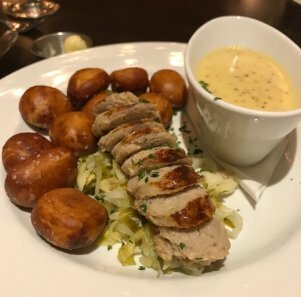 Our next plate, the chicken and apple sausage with pretzel bites, demonstrated that devotion. Warm, fluffy pretzels sat alongside a sweet, hand-stuffed sausage, with a mustard seed fondue for dipping and brussels sprout kraut that made the dish a pleasure to share. Our dinners highlighted Oregon’s local food strengths. 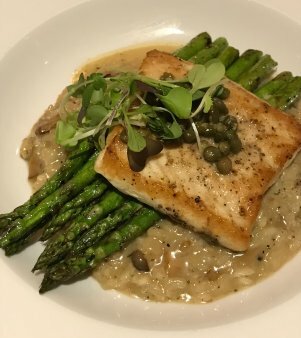 The evening special—wild caught Snake River sturgeon with asparagus, mushroom risotto and capers—was phenomenal: flaky yet hearty, with flavor bursting in each bite. 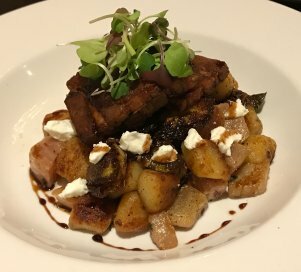 The sweet potato gnocchi with pork belly, goat cheese, beets, brussels sprouts and sage brown butter was so deliciously filling we had to take it to go and decline dessert! The mushrooms came from wherever the local mushroom hunters had been that day, keeping the locations of their bounty secret. 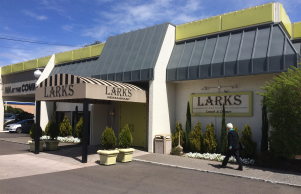 Every dish served at Larks Restaurant included elements from a number of local producers, like organic vegetables from Barking Moon Farms or One Leaf Farm, Rogue Creamery dairy products, and microgreens from Terra Sol Organics. We finished the evening with a sip of Noble Coffee, a roaster in Ashland, OR that prides itself on using the highest quality coffee beans from organic and sustainable farms. Larks Home Kitchen Cuisine is also offered at the Ashland Springs Hotel in Ashland, Oregon, a sister hotel of Medford’s Inn at the Commons.